Only your dental professional is qualified to diagnose your oral health and adjust your denture or partial. Dentures should be brushed inside and outside daily with a soft, large nylon denture tooth brush with round-ended bristles. Use denture creams instead of toothpastes, which are too abrasive and will scratch your denture. Rinse with cold water. Dentures warp if placed in hot water. Inspect your denture regularly for worn teeth. Worn and stained dentures can make you look older and cause your dentures to function poorly. Discuss all your current medications with your doctor and dental professional. Be sure to visit your dental professional regularly. Have loose dentures checked immediately as they can cause friction and pressure on the gum tissues and bones. 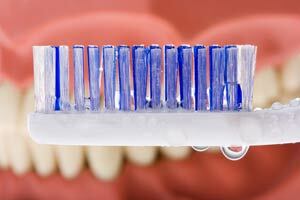 When not in use, cover dentures with water or a denture-cleaning solution to prevent them from drying out. Most dental insurance policies provide coverage for new dentures every 5 years.